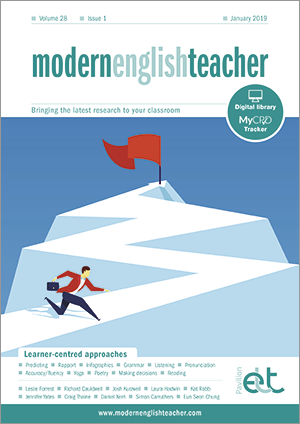 Modern English Teacher brings the latest research and reflections about English language teaching to your classroom. Subscribe today to get access to the print copy, the digital edition and full access to 5+ years' of articles to browse, download or print from the website archive. Not yet a subscriber? Find out more by clicking on our subscription choices below. Robert McLarty leads a discussion on this important topic. Kat Robb suggests how teachers and learners can benefit by switching the focus. Nick Michelioudakis describes where and when he uses it. Hall Houston and Andrew Starck discuss aspects of small teaching in the first of a series. Richard Cauldwell introduces two factors which are preventing students from improving their listening skills. Naheen Madarbakus-Ring describes her approach to teaching listening skills. Laura Hadwin reflects on the transferability of yoga to English teaching. Daniel Xerri describes the need to encourage teachers to keep both physically and mentally fit. Josh Kurzweil describes a way of helping students practise and remember key structures. Jennifer Yates looks at an area of concern to many learners and teachers. Craig Thaine revisits some of the traditional views on improving reading skills. Linda M Hanington and Willy A Renandya put into action their beliefs about extensive reading. Eun Seon Chung describes a research project she is planning with young learners based around poetry. Thu Tran suggests ways of getting clear outcomes from oral communication classes. Simon Carruthers explains why learning a language is not only about communication. Mohamed Yacoub argues passionately about the benefits of writing poetry in class. Austin Liu describes their results and some potential solutions. Mark Rooney and Catherine Thorpe show how their programme has succeeded over the last four years. Ekaterina Arshavskaya describes the use of the MBTI personality test with her learners. Lucas Kohnke and Billy Chan suggest a more creative approach to writing. Ben Dobbs suggests ways of using this analytical tool in the classroom. Keith Harding describes the importance of this key skill. Leslie Forrest suggests ways to build, maintain and renew it. Aloysious Clement and Murugavel Thanikachalam report on a study in India.